was born in New York City into a wealthy and well-educated family. Renwick initially studied engineering - following his father and two brothers - at Columbia University. When he graduated in 1836, He was already interested in architecture but had no formal training. 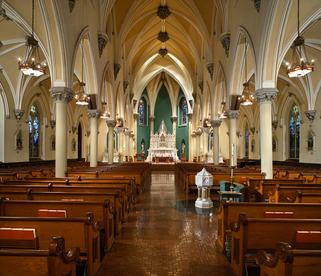 His first major commission came in 1843-to design Grace Church in New York City. Three years later he was working on Romanesque designs for Robert Dale Owen, director of the Smithsonian Institution in Washington, D.C. Renwick designed a Norman Castle (built 1846-49) of red sandstone - a welcome distinction among Washington’s otherwise classical buildings. Other work was for Vassar College’s main hall (1860) in Poughkeepsie, New York, and several churches, banks, hospitals, and asylums. He also designed a number of private houses for wealthy New Yorkers. Already known as a designer of churches, Renwick was asked in 1853 by Archbishop Hughes to design St. Patrick’s Cathedral in New York, a job that turned out to be a long and much-delayed project. In 1855 Renwick journeyed to Europe where he particularly studied the great French Gothic cathedrals. His original design for St. Patrick’s was a grandiose Gothic scheme, which was not fully realized. He and fellow architect William Rodrique were given the contract in March 1859. 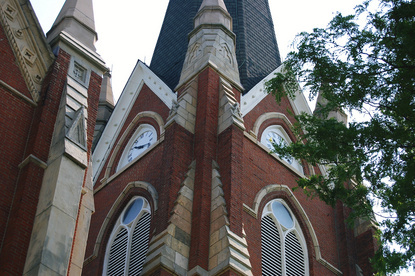 The church was dedicated in 1879, and completed in 1888. 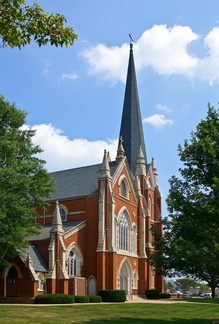 In 1870 James Renwick was given the contract to build St. John the Baptist Catholic Church in Canton, Ohio. It was completed in 1871 and dedicated in 1872.